Last year John Odom was pushed over the finish line by his daughter. In this year’s relay, he’ll walk, with the help of a cane. 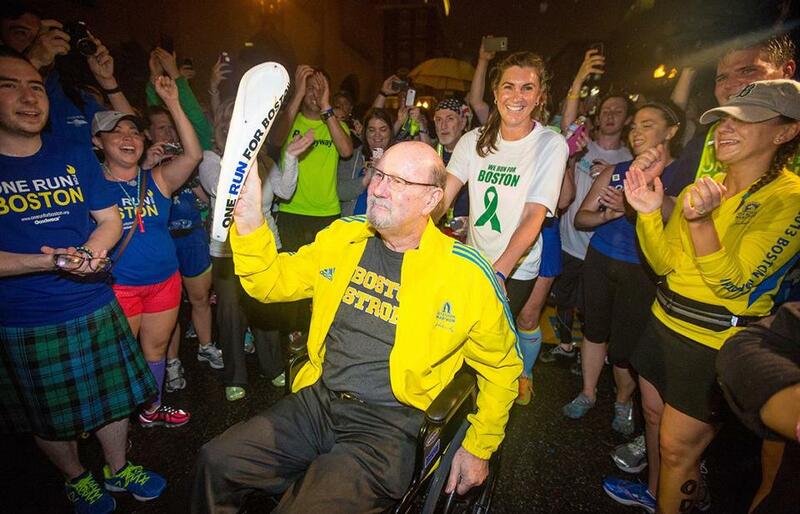 Boston Marathon bombing survivor John Odom will be the first person to pick up the baton in the One Run For Boston, a coast-to-coast relay scheduled to kick off Sunday afternoon in Santa Monica, Calif. The 66-year-old resident of Redondo Beach, Calif., is still recovering from the injuries he sustained a year ago, when he was struck by shrapnel on Boylston Street. When Odom participated in the inaugural One Run For Boston last year, his daughter pushed him across the finish line in a wheelchair. But Sunday he will walk, with the help of a cane, up Ocean Avenue. Odom has undergone 11 surgeries. His left leg is paralyzed from the knee down, and he wears a brace. He hopes to pass the baton to his daughter, who is running in the cross-country relay to raise money for One Fund Boston. More than 2,000 runners are expected to take part in the relay, which begins at 1 p.m. (Pacific Daylight Time) and will continue around the clock over the next 28 days, according to the organizers. Sporting blue T-shirts, the runners will log approximately 3,300 miles and cross 14 states before the baton ends up in Boston on April 13. The GPS-enabled baton will allow people to track the runners’ progress and follow their routes and current locations on the website, www.onerunforboston.org. Scott Gallant, 37, of North Reading, volunteered to run through portions of New Mexico and Connecticut. He participated last year and ran several miles through the southern part of the Rockies at night. “It actually downpoured on me for about half the run,” said Gallant. But temperature-wise, it was great running weather, he said. The One Run For Boston was the brainchild of three friends from England — Danny Bent, Kate Treleaven, and Jamie Hay — who watched the Boston Marathon bombings unfold on television and felt compelled to do something to help. Last year’s relay took place in July and raised $91,000. The organizers hope to raise $1 million this year. As of Saturday, more than $212,000 had been raised, according to the www.onerunforboston.org website. Among the hundreds of runners expected to arrive in Boston on April 13 will be Rosa Evora, 46, of Rockland, who is running the first part of the relay in California, too. Evora ran last year’s Marathon but never got to finish; she was stopped at mile 25 when the bombs exploded. She said she feels she owes the victims something. She also ran in last year’s One Run For Boston and carried the American flag during the final leg of relay. Overcome by emotion, she collapsed at the finish line. “I was crying, I had a lot of emotions,” she said. She’ll run the first two segments — about 18 miles — in California, then run the final two stages in Massachusetts. She also plans to run the Boston Marathon on April 21. Odom plans to attend the Marathon, too. Some of his doctors are running, and he’ll be cheering them on from the sidelines.